Are blondes really having more fun? Once upon a time, going blonde was a drastic option, reserved for those daring enough to strip their hair of all color. Let's be honest, you probably know someone that decided to bleach their hair and ended up dramatically changing their hair texture, and thus losing the hair's health. But, you probably also know someone that opted for fairer hair and shut it down. Some people (points to Beyoncé) look so amazing with honey tresses that it's worth taking a leap of faith (and finding a beauty professional that will help you). Celebs certainly have access to the best hairstylists in the business, so making a drastic change doesn't seem as scary. They're in good hands. Plus, stars have to shake it up, and a blond do certainly grabs our attention. 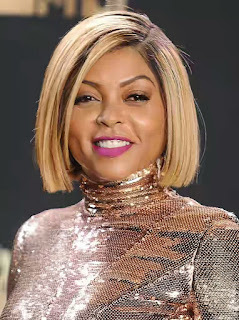 This season, the blond chop is making a major impact, with stars like Taraji P. Henson taking note. "[Taraji] was just like, 'I want to cut my hair. She already had an undercut, and it was growing in," celeb hairstylist Tym Wallace told Refinery 29. "She was loving how her curls looked, and was like, 'If we're gonna cut it, we're gonna cut it all.' She's like, 'I trust you.'" A few days later, the Empire star decided color it, stating how liberated she felt by her short hair. Since her original cut last month, she has been playing with the length and color, but we have to say that her blunt, blond bob was the forefront of an intense celeb trend. Loving the blond bob? Keep scrolling for the celebs rocking the trend! The All Eyez on Me star is a longtime fan of honey-colored tresses with good reason. It complements her skin tone and brings more attention to her features. Celebrity hairstylist Robear Landeros is responsible for the actress' 2017 BET Awards look. Tym Wallace's inspiration for the Empire star's look: "It's great to see a woman of her stature embrace her hair, and [cut] it so short. There's a difference between wearing a natural textured wig or weave, and actually wearing your natural hair. She's showing that she's all for the Black girl magic — showing these young Black girls that you are not defined by what society paints as beautiful when it comes to a Black woman and her hair. That was the main force for me." The actress and model appeared at the BET Awards with a platinum blonde bob, courtesy of Tokyo Stylez, the celeb hairstylist responsible for Kylie Jenner's famous wigs. If you want the look, but you're not ready to commit to being blonde, a wig is the perfect solution. Take note.